Discus make available Theremin star's unreleased project from 2007. Live in the studio, the Theremin discovers new possibilities in the company of Saw's brass and Collins' waterphone and percussion. 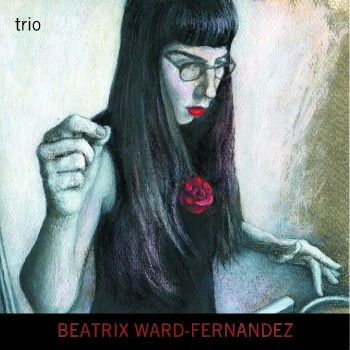 In mid 2006, when Beatrix Ward-Fernandez first discussed the recording of this CD with percussionist Charlie Collins, it was decided that the other instruments would have to be brass. The combination of electronics and brass is, in 20thC music, as classic as the string quartet or piano trio in earlier musics. From the early experiments of Varese, on through Xenakis monumental compositions to Muhal Richard Abrams, Leo Smith and the AACM of the present day, there is a vitality and "rightness" to the sound. But Beatrix' intention was not to simply carry on these experiments. She wanted to incorporate the myriad influences that have made her playing what it is today, and for this she needed multiple brass and an enormous palette - enter Derek Saw. The bulk of these tracks were recorded September 2007. They were recorded live in real time, a technique utilised partly because it was thought it would better convey the sonic possibilities of the Theremin, without studio trickery, but also because it could encapsulate the almost telepathic interplay between the musicians. This is a "working" group and it should be made to do so. The Theremin we hear here is not just a "novelty" instrument. It's use in what is essentially an acoustic group amply demonstrates its subtleties: and Beatrix' almost organic approach to her Moog Etherwave Pro. From pure abstraction to lopsided jazz grooves: from middle eastern drumming to AACM eclecticism: the theremin finally gets to speak it's own language. And wail a little! The theremin—one of the granddads of electronic instruments—gets a serious uplift via this program, recorded live in real time to convey the inherent attributes of this waveform instrument, sans studio processing. The majority of these tracks were intended for release on the obscure Purple Note label, but are now issued on the U.K.-based, avant-jazz Discus-Music. Theremin performer Beatrix Ward-Fernandez executes a rather holistic approach while delving into numerous genre-busting frameworks. She augments the session by using a Moog Etherwave pro Theremin and effects, although the familiar sound of this instrument is prevalent amid some wily electronics-based deviations. Hornist Derek Saw covers the lower registers with his valve trombone, tuba and flugelhorn phrasings, as percussionist Charlie Collins reinforces the trio's largely asymmetrical rhythmic focus. Ward-Fernandez renders the somewhat customary, weeping or teary-eyed imagery of the Theremin, yet the band engages in curiously interesting forms of counterpoint amid gobs of timbre and daunting frameworks. Nonetheless, the musicians embark upon a nouveau modus operandi. On "Maneuvers," the trio projects a hustle and bustle line of attack, complete with Saw's raspy horn parts and Collins' smack-dab mode of maintaining the flow, as Ward-Fernandez's slithery notes spawn bizarre imagery. "Simurg" is quite humanistic, as the band sojourns into playful minimalism. Otherwise, each track stands on its own. Unlike other cross-stylization outings where the Theremin serves as the lead instrument, listening fatigue does not become a negative factor here. Within the scope of these fourteen works, the artists execute liquefying themes and a mid-tempo swing vamp, complete with a degenerating meltdown on "Tone Time." Their ingenuity and wit is also highlighted on "Hullabaloo," which sounds like they're communicating with aliens by way of shortwave radio transmissions. In various regions of sound and scope, they dish out avant-garde Sousa March motifs and chatty free jazz-based discourses.